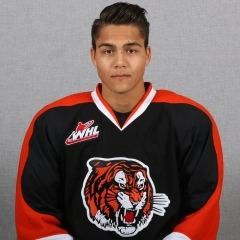 The first goal of the WHL playoffs was scored by D Clayton Kirichenko of the Medicine Hat Tigers. Kirichenko scored at 6:46 of the first period in their game against the visiting Brandon Wheat Kings. A 20-year-old from Sherwood Park, Alta., Kirichenko, the Tigers’ captain, has played in 239 regular-season games. This was his first playoff game — it was one to remember as he finished with two goals and an assist. . . . He split the first 130 of those regular-season games between the Saskatoon Blades and Vancouver Giants. 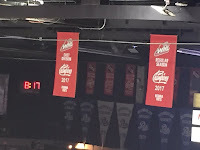 When the series between the Calgary Hitmen and the Pats got started in Regina, there were two new pennants hanging from the Brandt Centre rafters. Prior to the game, the Pats were presented with the Scotty Munro Memorial Trophy as the WHL’s regular-season champs. They then raised the East Division and Regular Season championship banners. Presumably, the Eastern Conference championship banner was saved for prior to next season’s home-opener. . . . 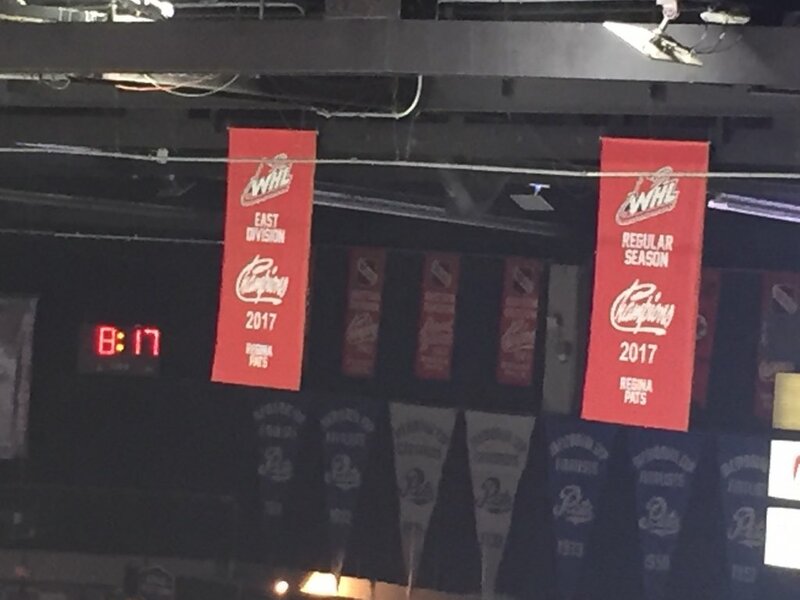 In Everett, the Silvertips raised their two new banners as U.S. Division and Western Conference champions. . . . These teams wouldn’t lower these banners and do it all over again on opening night next season, would they? Raising banners prior to the start of a playoff home-opener may not be a bad idea. It allows all the players to take part, something that wouldn’t be possible prior to the following season, what with graduating 20-year-olds and others who don’t return for one reason or another. Of course, F Sidney Crosby of the Pittsburgh Penguins should have drawn a suspension for the slash he put on the hands of Ottawa Senators D Marc Methot on Thursday night. Of course, Crosby wasn’t suspended. Having a superstar do something like that is a hockey disciplinarian’s worst nightmare, because they would rather suspend slugs than aces. If you haven’t noticed, Crosby has become quite the nifty swordsman with his hockey stick. F Nolan Patrick, who remains the consensus No. 1 selection for the 2017 NHL draft, sat out the Brandon Wheat Kings’ opening playoff game last night in Medicine Hat. After having sports hernia surgery in July, he played only 33 games during the regular season. I don’t know that being scratched last night was related to his previous problems, but sporting teams are starting to realize that recovery time from that kind of surgery is much longer than previously thought. The other notable scratches on the opening night of the WHL playoff were F Mathew Barzal and G Rylan Toth, both of the Seattle Thunderbirds. It would seem that Barzal continues to be bothered by the mumps, while Toth, who led WHL goaltenders in victories, has an undisclosed injury. Toth last played on March 11, when he left after the first period of a 6-3 victory over the host Portland Winterhawks. That was said to be a move made for precautionary reasons, but obviously things are more serious than that. I’m thinking USA Hockey has bitten off more than it can chew in its dispute with its national women’s team. On Friday, Dunkin’ Donuts, a major USA Hockey sponsor, said it continues to “support the current members of the U.S. team . . .” As well, the NHL and MLB players associations both issued statements of support for the women’s team, which is the defending IIHF world champion. It is scheduled to begin defence of that title in Plymouth, Mich., on March 31. . . . You’ve got to think that USA Hockey will fold its hand before then. Three former WHL coaches who now are head coaches in the OHL are a combined 3-0 in the playoffs. . . . Rocky Thompson’s Windsor Spitfires beat the host London Knights, the defending Memorial Cup champions, 4-3 on Friday night. . . . Earlier in the evening, Ryan McGill’s Owen Sound Attack trounced the visiting Kitchener Rangers, 9-1. . . . On Thursday, Kris Knoblauch’s Erie Otters, playing at home, beat the Sarnia Sting, 6-3. . . . Thompson, McGill and Knoblauch all played in the WHL, too. In the BCHL, the host Merritt Centennials beat the Penticton Vees, 2-1, in OT last night, forcing a Game 7 in their second-round series. F Tyrell Buckley won it at 10:23 of the first OT. They’ll meet again Monday, this time in Penticton. The Vees held a 52-48 edge in shots. F Chad Bassen (Regina, Vancouver, Medicine Hat, Everett, 2000-04) has signed a one-year extension with Iserlohn (Germany, DEL). This season, he had 10 goals and five assists in 50 games. He has dual German-Canadian citizenship. . . .
D James Bettauer (Prince Albert, Medicine Hat, 2010-12) has signed a one-year extension with the Straubing Tigers (Germany, DEL). He had 10 goals and four assists in 48 games this season. Bettauer has dual German-Canadian citizenship. . . .
F Jesse Mychan (Everett, Tri-City, 2011-13) has signed a one-year contract with Innsbruck (Austria, Erste Bank Liga). He started the season with the Colorado Eagles (ECHL), scoring 23 goals and adding 14 assists in 34 games. He was pointless in five games while on loan to the San Antonio Rampage (AHL). He signed with the Ravensburg Towerstars (Germany, DEL2) on Jan. 24, and had four goals and two assists in nine games there. F Dillon Dube of the Kelowna Rockets celebrated the start of the WHL playoffs by signing his first NHL contract. Dube signed a three-year entry-level deal with the Calgary Flames, who selected him in the second round of the NHL’s 2016 draft. . . . Dube, who was born in Golden, B.C., had 20 goals and 35 assists in 40 games with the Rockets this season, this third in Kelowna. Dube missed the first seven weeks of the season after returning from the Flames’ training camp with a knee injury. . . . He also played for Team Canada at the 2017 World Junior Championship. . . . According to capfriendly.com, Dube’s NHL salary would be US$742,500, $742,500 and $892,500, with a $70,000 salary in the minors. Their are performance bonuses of $182,500, $182,500 and $32,500, with three annual signing bonuses of $92,500. The Everett Silvertips have signed F Mark Liwiski to a WHL contract. Liwiski, from Dauphin, Man., will turn 16 on Aug. 8. He was a third-round selection in the 2016 bantam draft. Liwiski played for the midget AAA Parkland Rangers of the Manitoba Midget Hockey League this season, putting up 54 points, including 25 goals, in 37 games. In his draft season, he played for Parkland’s bantam AAA side, totalling 91 points, 39 of them goals, in 35 games. Craig Mohr is returning for a fourth season as the general manager and head coach of the junior B Fernie Ghostriders of the Kootenay International Junior Hockey League. . . . Mohr, from Calgary, has coaching history with the junior B Golden Rockets and Beaver Valley Nitehawks, as well as the midget AAA Calgary Northstars and the AJHL’s Calgary Canucks. . . . This season, the Ghostriders went 26-18-1-2 and finished third in the Eddie Mountain Division. They lost a best-of-seven first-round series in six games to the Kimberley Dynamiters. At Moose Jaw, G Jordan Papirny stopped 40 shots to lead the Swift Current Broncos to a 2-0 victory over the Warriors. . . . They’ll play Game 2 in Moose Jaw tonight. . . . Papirny was the starting goaltender for Brandon when the Wheat Kings won last season’s Ed Chynoweth Cup. . . . Papirny, 20, stopped 14 shots in each of the first and third periods in posting his second career playoff shutout. . . . F Tyler Steenbergen, a 51-goal man in the regular season, scored the game’s first goal, unassisted, at 11:18 of the second period. . . . F Glenn Gawdin provided insurance with an empty-netter at 19:48 of the third period. . . . There was one minor penalty called, that to Steenbergen for hooking, at 13:03 of the second period. . . . The Warriors got 31 saves from G Zach Sawchenko. . . . Announced attendance: 3,353. At Medicine Hat, the Tigers scored four PP goals en route to a 7-2 victory over the Brandon Wheat Kings. . . . Three of Medicine Hat’s first four goals came via the PP. . . . D Clayton Kirichenko got the Tigers started at 6:46 of the first period. . . . F Matt Bradley and F Mark Rassell followed with PP goals, at 18:57 of the first and 2:19 of the second, respectively. . . . F Stelio Mattheos scored for Brandon at 3:04, but Tigers F Zach Fischer got that one back, on a PP, at 8:55. . . . F Tyler Coulter counted for Brandon, on a PP, at 13:43, to make it 4-2. . . . Kirichenko scored again, at 14:48, with Rassell completing a hat trick with a PP goal at 12:32 and an even-strength score at 19:39. . . . The Tigers got three assists from D David Quenneville and two from Butcher. Kirichenko and Fischer had one apiece. . . . D Kale Clague had two assists for Brandon, with Mattheos getting one. . . . G Michael Bullion earned the victory with 26 saves. . . . Brandon G Logan Thompson stopped 45 shots. He faced 18 shots in the first period and 19 in the third. . . . The Tigers were 4-9 on the PP; the Wheat Kings were 1-6. . . . D Ty Schultz (broken leg) continues to rehab so was scratched by the Tigers. . . . F Nolan Patrick was among Brandon’s scratches. . . . Announced attendance: 3,583.
over the Calgary Hitmen. . . . Game 2 is in Regina tonight. . . . Brooks finished with two goals and two assists. . . . 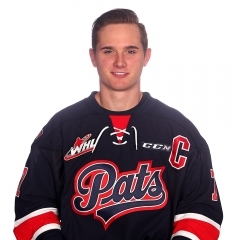 The Pats won it with a four-goal third period. . . . F Jake Kryski gave the Hitmen a 1-0 lead, on a PP, at 10:50 of the second period. . . . Regina scored the next three goals. . . . D Josh Mahura tied it, on a PP, at 16:28. . . . Brooks, who had the primary assist on Mahura’s goal, provided Regina with the lead at 4:25 of the third period, then upped the lead to 3-1 at 6:03. . . . Kryski got Calgary back to within a goal at 9:04. . . . Regina closed it out on goals from F Bryan Lockner, at 14:14, and F Austin Wagner, shorthanded, at 16:59. . . . F Filip Ahl had two assists for Regina. . . . G Tyler Brown stopped 20 shots to earn the victory. . . . Calgary G Cody Porter turned aside 27 shots. . . . Regina was 1-2 on the PP; Calgary was 1-3. . . . Regina F Nick Henry served a one-game WHL suspension. . . . Announced attendance: 6,484.
victory over the Kamloops Blazers. . . . The Rockets got three of their goals from players acquired at the trade deadline. 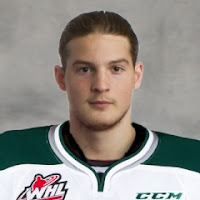 Twarynski came over from the Calgary Hitmen, while F Reid Gardiner’s rights were acquired from the Prince Albert Raiders. He was with the AHL’s Wilkes-Barre/Scranton Penguins at the time of the trade. . . . Twarynski opened the scoring at 17:20 of the first period. . . . F Tomas Soustal, who had missed the previous eight games with an injury, upped it to 2-0 just 28 seconds later. . . . Gardiner scored on a PP at 12:40 of the second period. . . . Twarynski added his second goal, on a PP, at 8:47 of the third period. . . . Soustal also had an assist. . . . Kelowna G Michael Herringer wasn’t particularly busy, stopping 15 shots to earn his third career playoff shutout. . . . The Rockets held a 15-3 edge on shots in the first period. It was 17-3 in the third. . . . Kamloops G Connor Ingram stopped 44 shots. . . . Kelowna was 2-4 on the PP; Kamloops was 0-3. . . . The Blazers scratched F Luc Smith, who was injured in Game 71 of the regular season. . . . Announced attendance: 5,512.
victory over the Victoria Royals. . . . They’ll play Game 2 tonight in Everett. . . . D Kevin Davis gave the home guys a 1-0 lead, on a PP, at 8:11 of the first period. . . . The Silvertips took a 4-0 lead with three goals in 4:20 late in the second period. . . . F Patrick Bajkov upped it to 2-0 at 12:04. . . . F Dominic Zwerger then scored twice, at 14:27 and 16:24, the second one coming via the PP. . . . F Jack Walker scored a PP goal for Victoria, at 19:03 of the second period. . . . Victoria F Dante Hannoun got the Royals’ other goal, on a PP, at 14:58 of the third. . . . Bajkov also had two assists, with Davis and Zwerger getting one each. . . . Walker added an assist to his goal. . . . Walker has tied the Royals’ record for career playoff goals (13), assists (16) and points (29). He shares all three with Brandon Magee (2011-15). . . . Everett G Carter Hart stopped 30 shots, nine more than Victoria’s Griffen Outhouse. . . . 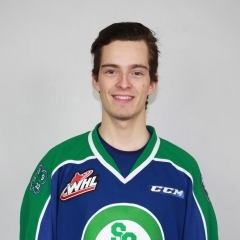 The Royals were 2-4 on the PP; the Silvertips were 2-5. . . . D Chaz Reddekopp and F Ryan Peckford both returned to Victoria’s lineup after being out with injuries. . . . Announced attendance: 3,241. A big night for playoff hockey in the Northwest. 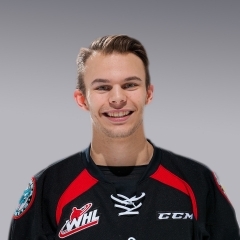 over the Tri-City Americans. . . . Stankowski was starting in place of the injury Rylan Toth. . . . Stankowski, who turned 17 on March 9, was making only his eighth WHL appearance. In the regular season, he was 3-0-1, 2.18, .910. . . . He stopped 18 of 19 shots in the third period. That included a save on a penalty shot by F Morgan Geekie at 9:39 of the third period with Seattle leading, 3-2. Moments later, he beat F Parker AuCoin on a shorthanded breakaway. . . . The Thunderbirds got two goals from F Keegan Kolesar, including the game’s first score at 5:37 of the first period. . . . F Ryan Gropp made it 2-0, on a PP, at 8:50, with Kolesar earning the primary assist. . . . Tri-City F Jordan Topping cut into the deficit at 10:10. . . . D Austin Strand restored Seattle’s two-goal lead at 4:50 of the third period. . . . F Austyn Playfair pulled the Americans to within a goal when he scored shorthanded, at 7:26. . . . Kolesar put it away with his second goal, at 17:46. . . . Seattle D Ethan Bear had two assists. . . . Tri-City G Rylan Parenteau stopped 27 shots. . . . Seattle was 1-6 on the PP; Tri-City was 0-7. . . . The game was delayed for a couple of minutes in the second period after Seattle D Turner Ottenbreit’s clearing attempt struck referee Kevin Bennett in the head. He went down briefly, but didn’t miss a shift. . . . 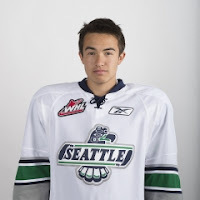 The Thunderbirds scratches also included F Mathew Barzal (mumps). . . . Announced attendance: 3,359. At Prince George, the Portland Winterhawks scored a pair of PP goals as they beat the Cougars, 4-2. . .
They’ll play Game 2 in Prince George on Sunday. . . . The visitors took a 1-0 lead when F Brendan De Jong scored, on a PP, at 4:34 of the first period. . . . The Cougars tied it at 17:49 when F Jared Bethune scored a PP goal. . . . The Winterhawks scored the game’s next two goals, with F Skyler McKenzie counting at 18:39 and F Keegan Iverson adding a PP goal at 3:06 of the second period. . . . F Jansen Harkins got the Cougars to within a goal at 2:43 of the third. . . . Portland put it away with an empty-netter from F Colton Veloso at 19:22. . . . D Caleb Jones had two assists for Portland. . . . The Cougars got two assists from F Colby McAuley. . . . G Cole Kehler stopped 23 shots for Portland, while Prince George’s Ty Edmonds blocked 31. . . . 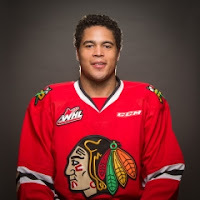 Including the regular season, Kehler has posted nine straight victories. . . . Portland was 2-5 on the PP; Prince George was 1-3. . . . F Cody Glass, who missed the last five periods of Portland’s regular season, was in the lineup and drew one assist. . . . The Cougars again were without F Brad Morrison. He took the pregame warmup before being scratched. . . . Mike Johnston earned his 50th career victory as Portland’s head coach, the 18th man in WHL history to reach that milestone. Don Hay of the Kamloops Blazers is No. 1, at 106. . . . Announced attendance: 5,418.